In one of my previous posts regarding early modern Spain I referred to Martin Martinez, a physician who was an avid promoter of the experimental method. Today I want to examine a debate he had regarding the rejection of astrology. In this blog we have provided many illustrations of the methodological statements typical of those who promoted and adopted experimental philosophy. We have shown the insistence in rejecting the work of those that rely solely on speculation, but we have not yet seen any examples of the work of speculative philosophers. The case of astrology in 1720s Spain can shed some light on the kind of speculative science rejected by experimental philosophers like Feijoo and Martinez. Martinez goes on listing a number of claims astrologists make, in particular related to the effects the movement of the planets and stars, eclipses, and comets have on the health of individuals. 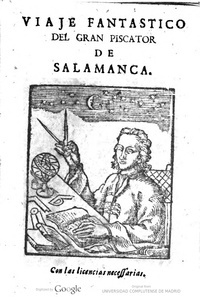 But Martinez is directing his claims to one individual in particular, Diego de Torres Villaroel, a mathematician and astrologist who published yearly almanacs with predictions under the pseudonym “el gran Piscator de Salamanca”. Leaving the calendars aside, Torres also published an essay containing his ideas on the nature of the earth and the heavens. The text was first published in 1724 under the title Viaje fantastico del gran Piscator de Salamanca (The fantastic journey of the great Piscator of Salamanca), and then again in 1739 as Anatomia de todo lo visible e invisible (Anatomy of all that is visible and invisible). It is this book that Martinez targets, and will serve as our illustration of the kind of speculative philosophy the novatores rejected. I could go on drawing on passages from Torres’ book, but the ones quoted above are enough to illustrate the opposition to astrology that the Spanish novatores insisted on. It is important to remember that figures like Feijoo and Martinez had a genuine worry regarding the influence of astrology. Unlike our present time, in the early decades of the eighteenth century astrology was still considered by many as a genuine science, and it was this (more than the almanacs) that motivated the novatores to call for a ban on astrology.